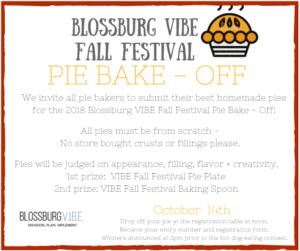 Stop by Blossburg for the Blossburg Fall Festival on Sunday October 14th, 2018 from 12 to 4 pm. It will be a fun filled day of craft vendors, musical entertainment, and games. Come on out and enjoy a great day with your community! Bloss FD and Ambulance Assoc. If you are looking for something to do, someway to help out, or maybe you need to get more community services hours for school , then volunteer to help V.I.B.E. put on the Fall Festival! 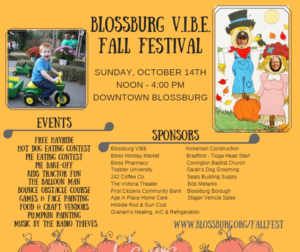 For more information about the Blossburg Fall Festival, contact Jackie, the Fall Festival Team Leader at 570-404-4632. Thank you to all of our wonderful supporters. Go out and show them your support by shopping at their local business or saying Thank You.